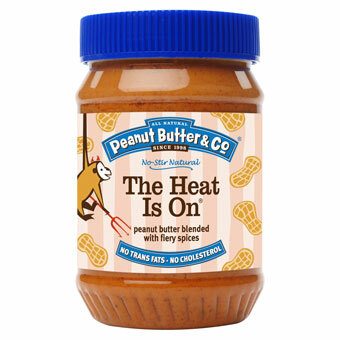 REVIEW: Peanut Butter & Co.’s The Heat is On – I Love It Spicy! I always get excited when we step out of the normal fiery product review, and do something outside the box. This review is for a spicy peanut butter from a NY company that I met at the Fancy Food Show in DC. It seems fitting to do this review now right in the middle of our Ultimate Chilehead Comfort Food Showdown, since PB & J is a classic comfort food. I had this peanut butter about 2 years ago for the first time. It is sometimes hard to find, but what isn’t hard to find is their other creative peanut butter line. I absolutely love their White Chocolate Wonderful Peanut Butter. I only wish they had a crunchy version of it or a spicy crunchy version of it. It is an awesome blend of peanut butter and chocolate, and I swear it is more milk than white chocolate. Another one on my must have list is their Cinnamon Raisin Swirl for those like me that love their cinnamon. If you love both peanut butter, raisins and cinnamon then you need to get that one too. Not only did we review Peanut Butter & Co.’s spicy “The Heat is On”, but they were nice enough to also send one of their biggest sellers, their “Dark Chocolate Dreams”. I think the reviewers got excited with that extra freebie. A couple of the reviewers talk about both products. Their website is ILovePeanutButter.com and ILoveItSpicy is reviewing them. Ain’t that special? We are always asked about our formula for success. We see it this way: as kids, we grow up eating peanut butter sandwiches. But many of us never really lose our taste for this sticky stuff. Most of the peanut butter on the supermarket shelves are formulated, packaged and marketed with kids in mind. But in reality, adults eat more peanut butter than kids every day. And while most adults grew up on mass market brands, as we get older, we are ready for something a bit more sophisticated. And that’s where Peanut Butter & Co. comes in. We’re the good-for-you, indulgent treat that appeals to adults as well as kids. Peanut Butter & Co.’s line of all-natural peanut butter contains no hydrogenated oils, no cholesterol, no trans-fats and, no high fructose corn syrup. Our flavors are gluten-free, vegan (except for The Bee’s Knees which is vegetarian), and certified kosher. Lastly, but just as importantly, we only use USA-grown peanuts in our peanut butter. At Peanut Butter & Co., we continue to find ways to bring you healthful and delicious products. We’ve just introduced our new line of all-natural baking mixes as well as peanut butter packets that you can enjoy on the go. We’ve got lots more in store, so please keep us company on your journey to deliciousness! Before we get to the review, I want to point out something really cool on their website. They have a bunch of cheap swag on their like a $4 frisbee, a $6 lunchbox(presently sold out), and a $5 beach ball to name a few things. What I love the most is their $2 Peanut Farmer’s Starter Kit. If you love peanuts and want to start growing them, then check this out HERE You will also see a lot more products at their online store besides peanut butter like jelly/preserves, 3 flavors of the infamous marshmallow stuff called Fluff, and some baking mixes. Even a PB recipe book. Check it out. This would be great to make a thai peanut sauce with.